So far in 2016, New England and in particular the Greater Boston area was spared the high-impact weather that can come almost every season from snow storms to scorching summer heat to autumn hurricanes or more tropical storm-like conditions. Any of these natural conditions can cause power outages. The other cause, which is too often taken for granted, are the large power utility grid outages brought about primarily by those equipment failures. Your answer to piece of mind is a home or commercial generator: a permanently installed standby generator or an immediate back-up portable generator. At J.P. McCurdy Electric Co., www.jpmccurdyelectric.com we offer both options through one of the world’s finest small-engine manufacturers, the Briggs & Stratton Corporation. So here’s how to take the stress out of power interruption situations; stresses caused by a lack of refrigeration resulting in spoiled food, heating and/or cooling systems to keep you from the likes of frozen pipes or failed sump pumps and cooking stoves and ovens, all of which provide everyday living comforts. A Briggs & Stratton Home or Commercial Stand-by Generator System installation takes care of a home’s more high-wattage appliances like air conditioning units, stoves and clothes dryers. Depending on your business needs, type of electrical service and needs, a standby generator can provide reliable temporary power for office equipment and small machinery. These generator systems need to be professionally installed to your existing natural gas or propane line so when poweris interrupted, this generator automatically turns on within seconds. Now that’s worry-free piece of mind! The system also continuously monitors itself periodically so as to be ready when weather or emergency strike. 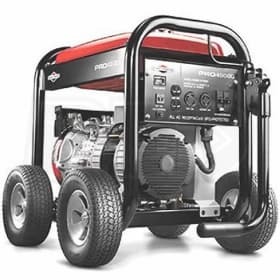 The other option offered by Briggs & Stratton is the immediate back-up power supply of the Portable Generator. This a unit growing in popularity, typically powered by gasoline and maneuverable around your property, designed to provide reliable temporary power during an outage to a few essential items like appliances, TVs, refrigerators and basic light circuits. Designed for quick transition, the home or business owner flips a switch to de-activate the everyday main panel and activate the emergency stand-by panel until neighborhood power grids are restored. Like its big brother systems, the portable generator needs to have the stand-by electrical panel to the home’s circuitry designed and installed by a professional for ensured reliability. Again that’s where the quality work of J.P. McCurdy Electric Co. www.jpmccurdyelectric.com is your best choice. With offices around greater Boston and the North Shore, they are certified and highly qualified electricians and technicians waiting to help your home or business be ready to deal with weather-related or other emergency conditions at a moment’s notice. Living in New England is, in itself, a unique experience dealing with the four distinct seasons. Summer can bring very hot and humid weather, while winter brings a 180° turn to frigid and article like conditions. New Englanders are no strangers to snow. After a fresh snowfall roofs are snow-capped and look beautiful, and quite charming. But with that beauty, snow contains a great amount of weight, and the weight rises enormously when rain, ice and sleet are added to the mix. Experts tells us that approximately two feet of snow on an average sized roof can be the equivalent of 19 tons. At 2,000 pounds per ton, that’s a lot of weight and this weight places an enormous amount of stress on a roof and weakens its structures. Furthermore, the melting of the mass of snow can cause water leakage that can decay roofs, destroy insulation, flood attics, ruin gutters and damage the interior of a home. With the constant melting and freezing of snow on the roof and in the gutters, there is a great chance of an Ice Dam forming. 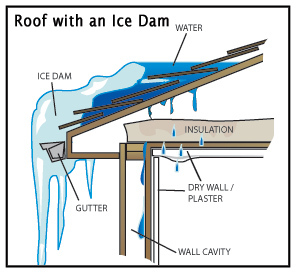 An Ice D am forms when the roof over the attic gets warm enough to melt the underside of the layer of snow on the roof. When it forms, the water backs behind the ice dam and creates a pool. This pool of water can leak into your home and cause damage to walls, ceilings, insulation, and other areas. The water freezes, gradually growing into a mound of ice forming icicles. The flatter the pitch of the roof, the easier it is for an ice dam to get a grip. Gutters at the eaves can also trap snow and ice. If snow and ice build up high enough in the gutter, it can provide a foundation for an ice dam. Those icicles hanging from the gutters, as enchanting as they may look, can mean trouble. This could be a sign of serious damage occurring due to ice dams. NOTE: Before trying to remove snow from your roof, consider that clearing a roof can be a hazardous chore. Think before you decide to go on the roof with a shovel in hand to attempt doing it yourself. Most experts don’t support the idea of people climbing onto their roofs to remove the buildup, as the weight of a person may be just enough to trigger the roof to collapse. Additionally, taking the wrong step can easily send you sliding down your roof, putting your life in danger. The best way to handle an Ice Dam is to prevent it before it occurs by using De-Icing Cables. 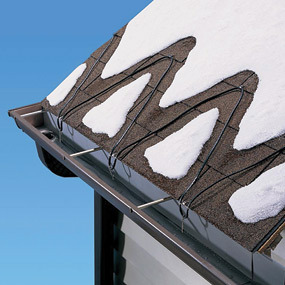 De-Icing Cables heat the roof edge and keep it free of ice. Installation of the cables should be done prior to winter. De-Icing Cables are attached to the edge of the roof where ice tends to build up. Since the cables need an exterior outlet for electricity, we recommend using a license electrician to, not only do the installation, but to suggest the best product for the application. The only downsides are 1) the cost of electricity (which is small for a standard cable used intermittently), and 2) the routing of draining water away so it doesn't freeze and build up at the end of the downspout. All freeze protection products can be controlled using a variety of thermostats, controllers, sensors, and control panels. What you need to know about Knob and Tube Wiring. When electricity was first made available in residential and commercial buildings during the late 19th century, it was connected through a wiring system called “knob and tube” wiring. Up until the late 1940s and early 50s, knob and tube wiring was innovative bringing Edison’s light bulbs to homes around the country. But nowadays it’s outmoded and deteriorating …with the potential to be a hazard. Knob & tube wiring should be replaced whenever possible. So what is exactly is knob-and-tube wiring? the wires as they pass through wood framing members such as floor joists, wall studs or ceiling beams. Splices were usually made by soldering the wires together and then just wrapped up with cloth tape, left exposed without the splice being contained in an electrical box (a requirement today). The wires were protected with a cotton cloth covering saturated with asphalt, called “loom”. While knob-and-tube wiring is older, it is not necessary to replace it simply because you have it in your house. But it is important to be aware of concerns such as short-circuiting and overheating. Having it inspected and evaluated annually, is important. The best time to replace knob and tube wiring in your house is when you are remodeling your home. This is less expensive, as walls, ceilings and floors are usually open and accessible. Many homeowners replace knob-and-tube as individual rooms are remodeled. Remodeling projects usually include adding more receptacles, ground-fault- and arc-fault circuit interrupters. The National Electrical Code prohibits the use of insulation of any sort installed in walls or ceilings where knob and tube wiring exists. This is because of a potential fire hazard. If any sort of insulation comes into contact with the conductors, they can’t disperse heat properly. 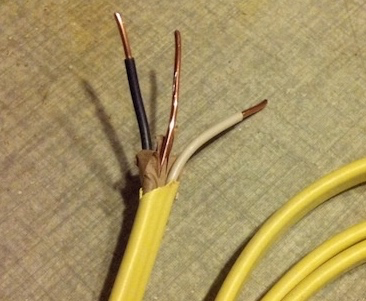 Poor Connections: Problems with knob-and-tube wire almost always result from amateurish connections made after original installation. Damage: Knob-and-tube wiring is invariably old and may have been subjected to wear and tear over the years. Brittleness: As mentioned earlier, the rubber insulation on knob-and-tube can become brittle caused in high heat areas, including connections above ceiling light fixtures. Circuits Extended: Since older electrical systems had few circuits by today’s standards, the chances of each knob-and-tube circuit having been extended over the years, is very good. This increases the possibility of poor connection, damage and brittleness. With knob and tube, there are only two wires. The black and white wires are run separately and are spaced several inches apart, allowing for ventilation and for the heat to disperse. In modern wiring, the black wire, white wire and ground wire are all wrapped up in a single cable. 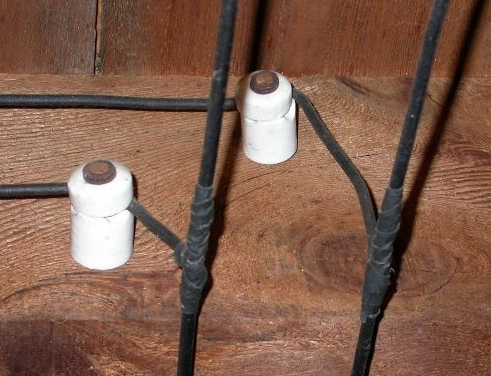 In many instances with knob and tube, the “neutral” wire had been switched with the “hot” wire. This dangerous practice violates modern electrical code, but was a common practice in the knob and tube era. 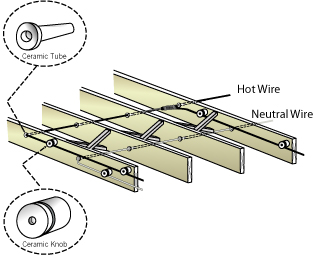 Knob-and-tube wiring is insulated with rubber. Modern wiring is insulated with plastic. The cloth-like or rubber insulation used on knob-and-tube wiring, deteriorates and may cause the conductor to be bare and unprotected – a real shocker (so to speak), or in some cases – a real fire! With knob and tube, there is no equipment-grounding conductor, such as a ground wire. A ground wire, sometimes also referred to as a “grounded” wire, is an electrical wire that neutralizes and protects devices, appliances, and buildings from electrical current problems and shocks. Grounding is arguably the most important part of a sound electrical system. One telltale sign that an electrical outlet might be fed with knob and tube is that the receptacle is only a “2-prong” version, missing the 3rd prong on the bottom, which is for the grounding conductor. Knob & Tube wiring served its purpose back in the day when it was used to power things such as electric lamps and table fans – not modern equipment such as air conditioners, refrigerators, computers, space heaters, etc. With today’s modern appliances and conveniences drawing much greater loads than knob and tube was ever designed to handle, homeowners are rolling the dice in not dealing with the situation. As a result of the possible hazards posed by this antiquated wiring system, most insurance companies will not insure your home if it contains knob and tube wiring, or a fuse panel, for that matter. We, at McCurdy Electric, are always available to inspect and consult with you regarding safety issues, concerns and your options. Our expert team can quickly diagnose, and if necessary, upgrade the old wiring system to current safe code standards. Having had many years of experience working in older New England homes, we know how to quickly and safely remove and replace knob and tube wiring at a very competitive cost. I’m John McCurdy, president of McCurdy Electric. For any questions regarding knob and tube wiring or any other electrical issues, please call me at 781-595-7074 and I will personally answer any questions or concerns you may have. Should you install a Generator this winter? A generator is a great addition to your home for several reasons. Most importantly having a generator can be extremely useful during tough New England winters. that your pipes won't freeze and the sump pump if needed will run. is extra snow and sleet on power lines you may loose power to your home. Living in New England the weather is so unpredictable this small investment is well worth the safety it will bring to you and your family. also set you up on a service plan and are always here to answer any questions. investment for you and your family all year round. At J.P. McCurdy Electric we'll provide the right generators for your home. Call J.P. McCurdy Electric today for a free estimate. In general, an outdoor electrical outlet is the same as the indoor outlet within your home. Typically, an outdoor receptacle is a 120v, three-pronged grounded outlet that the majority of your appliances plug into. You find them on walls, decks, and by the pool. Needless to say, outdoor outlets are used more frequently in the warmer and milder weather. These areas lend themselves to more time spent outside, which makes them a must have. The simple definition, is that you can use them for anything electrical that you would typically use outdoors. 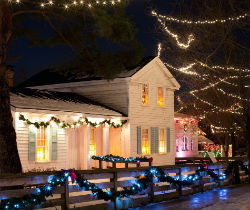 Outdoor outlets are most commonly used for lights, especially holiday lights, Christmas, and Halloween being the most common. When used in an outdoor kitchen, they can be used to plug-in a mini fridge, microwave, blender, and a lot more. One of the most popular uses is electrical lawn devices such as electric mowers, weed trimmers, and blowers. Though it may seem less safe to use electricity outside, it is actually very safe to do so. 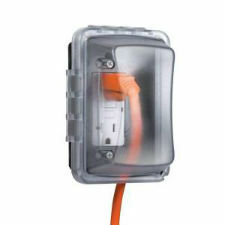 As a matter of fact, outdoor outlets have protections in place to make certain that they remain as safe as possible. The way this is accomplished is by using GFCI outlets, rather than the customary electrical outlets. GFCI outlets are equipped with sensors that can detect small changes in electrical current and shuts the power off when necessary. This will protect you from accidental electrocution if there is a short, and if something electrical comes into contact with water. Furthermore, the outlet is covered so that they are protected from wind, rain, dirt and other elements. An electrical safety inspection involves a comprehensive check-up of your entire electrical system. Over time and with frequent use, all electrical installations have a tendency to deteriorate. Therefore, an electrical inspection determines whether the electrical system is good for continued use, or hides any impending dangerous electrical hazards. It is important that an electrical safety inspection be carried out only by licensed professionals. J.P. McCurdy Electrical Services offers a 37-point whole house electrical inspection with a written report. Many people evade an electrical inspection until an electrical problem happens. We suggest that you be more proactive and make full use of our 37-point whole house electrical inspection. Electrical hazards, such as damaged wire insulation and poor grounding, cause hundreds of accidental electrocution deaths annually in the United States. Overloaded circuits, poor quality electrical equipment and misuse of electrical products are examples of electrical hazards that lead to fire, and injuries. Attempting to do electrical work on your own is not only dangerous, but it can also lead to expensive repairs and fines. 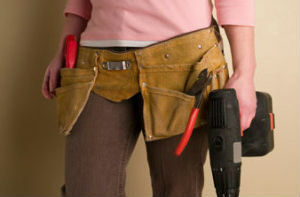 Though, there’s nothing wrong with homeowners trying small projects, like repairing drywall or maybe even a backsplash. Nevertheless, electrical wiring should never be DIY. Period. The stapled wire. Usually DIYers know that you should never nail wires to a wall stud. There are straps that hold the wire tightly in place, but not overly so which can be installed with small nails. However, some people will use a staple gun to keep the wires tight. While it is true that the metal does not actually push through the protective cover, the power of the machine can tear the cover and result in a metal to metal connection. The wrong connection. A ground-fault circuit interrupter (GFCI) is required for rooms where water and electricity are used in close proximity to one another, for instance, the kitchen and the bathroom. Some people like to install these outlets themselves, but fail to read the wiring diagrams. Wires are incorrectly connected, then malfunctions and worse occur. Exceeding ampacity. Do you own an older home? If you have not had your house rewired to current codes, there is a good chance that the new ceiling fan you install will draw more current than the old light fixture you replaced. The wiring was run with the old fixture’s in mind. When the ceiling fan exceeds the wiring’s ampacity, the wire is likely to get hot. This can put you at risk of a house fire. Shaved insulation. A wire’s insulation protects you from harm when you touch it. Unfortunately, sometimes a wire simply does not fit into the tight spaces that you want it to go into. Some people have begun shaving away at the insulation to make the wire more bendable and sufficiently decrease its size to fit into the crevice. This is very dangerous, and damaged insulation may expose live wires that can be deadly to the touch. Electrical overloads. When an inadequate number of outlets make the use of modern conveniences difficult, the use of extension cords is often a makeshift solution. Occasionally, an extension cord is plugged into another one. When too many appliances are plugged into any one outlet, the wiring is likely to heat up. As previously mentioned, overheating wires are dangerous. Power failures can be overwhelming, and dangerous If you're not ready for them. At the very least, power failures disable heating and air-conditioning systems, refrigerators, sump pumps, and lighting. If the power failure lasts for any length of time, your home can become uncomfortable and possibly not fit to live in. Your water pipes may freeze and burst, the food in your refrigerator may thaw and spoil, or your sump pump may stop working, flooding your basement. Any of these occurrences can become expensive. If you're snowed-in during subzero temperatures, grid failure can even be critical. 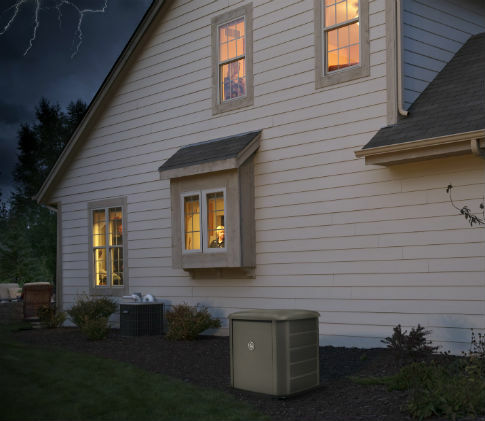 However you can make your home blackout-proof by Installing a standby generator. 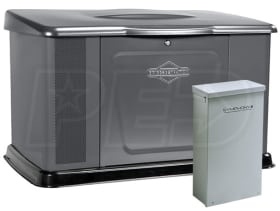 Standby generators offer a trustworthy solution to long-term outages. 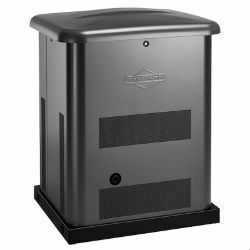 Unlike portable generators, they're installed permanently on a concrete pad in your yard and will provide uninterrupted backup for days. That's because they're connected directly to your home's electrical panel and powered by an external fuel supply, such as natural gas, liquid propane, or diesel. The genius behind the functionality is an automatic transfer switch that disconnects your home from your utility after detecting an interruption in service. Once your home is safely off the grid, the switch starts up the generator before transferring its power to the home's electrical panel. At the core of the system is an internal combustion engine, which is typically fueled by the local natural gas supply. Where natural gas isn't available, liquid propane or diesel stored in a large tank close by can be used. Keep in mind that these systems depend on a limited amount of fuel that could run out if storm damage prevents delivery or increased demand hinders supply. When municipal power recommences, the switch shuts down the generator and reconnects your house to the grid. This flawless operation makes standby generators perfect for families with small children, as well as those needing uninterrupted use of electric-powered medical equipment. They are also crucial for anyone running a business in their home. 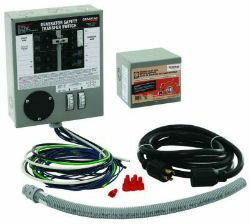 The transfer switch acts as a safety device, as well. It prevents back-feeding electricity to the grid, a potentially fatal practice that can start fires and harm utility workers attempting to restore your neighborhood's power. Hire a licensed electrician, or a certified generator technician not only for your load needs, but also for the planning, and installation. If you're planning on connecting to your local natural gas system, you'll need a high-pressure, high-volume line. Most generators require gas supplied at 5 to 7 inches of water-column pressure. If the pressure is not high enough, you risk damaging the unit or the supply itself. Only your gas company can give you more gas pressure. Installing a standby generator is not a do-it-yourself project It requires advanced electrical skills, as well as knowledge of local building codes. You'll also need permits before you start and inspections when you're done. The higher the generator's capacity, the more circuits it can power at once. However, the size of your generator should be determined by your needs in an emergency situation, you're not looking to power each and every appliance and device during critical times. Many homeowners choose a generator based on what they can afford. A quality essential-circuit system starts at approximately $3000, and that's not including installation. Then there's the price of fuel: A fully loaded 7-kw unit consumes around 140 cubic feet of natural gas per hour. Like cars, standby generators run nonstop for many hours, so they have to be maintained as if they were cars. In general, the bigger units require more care. After 24 to 48 hours of nonstop use, you should get it serviced. Your generator will stay in top shape through a lifetime of outages if you check the engine oil daily during use, replace overworked or deformed motor brushes, and avoid starting or stopping it under load whenever possible. Summer is almost here, and when temperatures begin to rise, many people can expect their electric bill to rise as well. When the hot weather hits, air conditioners will be working full blast sending a typically reasonable electric bill through the roof. With this being said, here are six ways to keep your house cool this summer and save money in the process. Use the energy saver option on your AC. When you are not at home, use the energy saver option on your air conditioner rather than turning it off. The energy saver will keep your house at a cool temperature. If you turn off your air conditioner the temperature in your house will go up, and when you turn the unit back on it will need to work harder to cool your house down again, as a result increasing your electric bill. Install ceiling fans. When you're trying to save money on your electric bill during the summer, it is prudent to limit the use of the air conditioner to exceedingly hot days. Consequently, ceiling fans do not use nearly as much electricity as an air conditioning unit does. Well placed fans can keep cool air circulating in the house, and keep your home from feeling like a sauna. 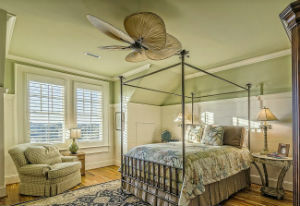 If you do not already have them installed in your home, consider purchasing ceiling fan units. Change the AC filter. A dirty air conditioner filter can restrict air flow, and as a result your unit has to work harder in order to pump cool air through your home. The end result is an inefficient system that runs up your electric bill. Some filters need to be swapped out once per month, but it is best to check your unit to see what is recommended. Keep some windows covered. This depends on which windows in your home get the most sun. To obstruct the windows with the most sun make sure you buy blinds or curtains to cover them. By doing this, you will be able to hinder some of the heat before it gets into your home. Keep all needless lights turned off. Any kind of light gives off heat, which causes your AC to run longer. What's more, consider switching to CFLs. Incandescent lights give off more than 90% heat and only 10% light, compared to CFLs, which provide the same lighting as incandescent bulbs but generate less heat and use 75% less energy. Plant some trees. This does not assure an immediate savings, but as soon as the trees are taller, and bushier, you can save money. A tree that casts shade onto your AC unit will help it running more efficiently. If you want to lower your electric bill, consider some of the tips above. They will help cut your bill during the summer months, and the money that you save can be used for summer vacation! During dinner parties, and family celebrations, the kitchen compels people to come together and socialize, whether there is a gourmet meal, baking in the oven or a simple plate of cheese and crackers on the counter. Throughout the week, the kitchen is usually a place of ongoing activity, with food preparation, sitting down for meals, or grabbing a snack, this gives the refrigerator and microwave a workout. 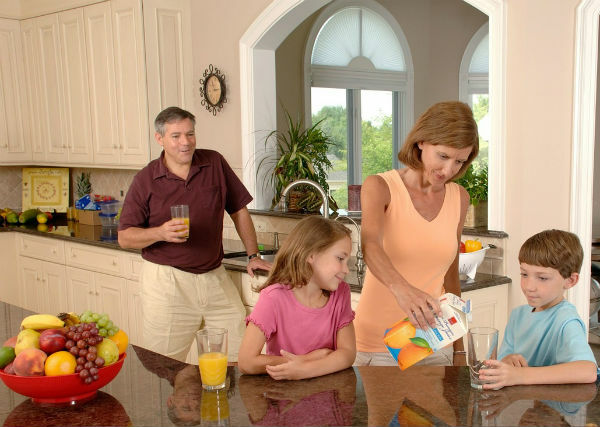 Clearly, the kitchen is the center of activity in many homes, which helps explain why so many accidents, and about 50% of all fires take place there. Since the kitchen is such an active place in most people's homes, and a hotbed for accidents and fires, we thought that National Electrical Safety Month would be a good time to offer electrical safety tips for the kitchen. Perhaps, some of the tips we offer may seem like common sense. However, the cause of most accidents really don't take people by surprise. Most accidents occur when people are in a rush, take shortcuts, or are not paying attention. With repetition, you can improve your electrical safety care. Plus, along the way, we hope that you will learn a few things, as well. Test all of the ground fault circuit interrupters (GFCIs) in your kitchen. These outlets cut off the flow of electricity when they sense a problem, such as the presence of water. GFCIs can be a life saver in kitchens, where water is a continuous presence. Ideally, GFCIs should be checked every month; in practice, try to check yours twice a year. Check the batteries in the smoke detector located closest to your kitchen. If possible, you should have a detector installed at least 10 feet away from the stove (to prevent false alarms). Turn off a large appliance at the circuit breaker if you ever receive a shock, and not one from static electricity, but a full-blown shock. This can be a sign of a serious problem with the wiring, which should be inspected immediately by a licensed electrician. Regardless of the presence of GFCIs, take the extra safeguard of keeping countertop appliances such as the coffee maker, toaster oven, food processor, and can opener at least several feet away from the sink. Unplug countertop appliances when you're not using them. Yet again, this is just a precautionary step. Also, be sure to unplug appliances before you clean them. Keep the cords of small appliances out of the way of any, and all heat sources so that they don't accidentally catch on fire. For the same reason, don't wrap a cord around an appliance until it has fully cooled down. Keep your stove and oven free of grease, and food buildup to reduce the chance of fire. In addition, keep the stove and oven free and clear of paper and cloth, such as pot holders, dish towels, and paper towels. Vacuum the coils at the base of your refrigerator on a regular basis. 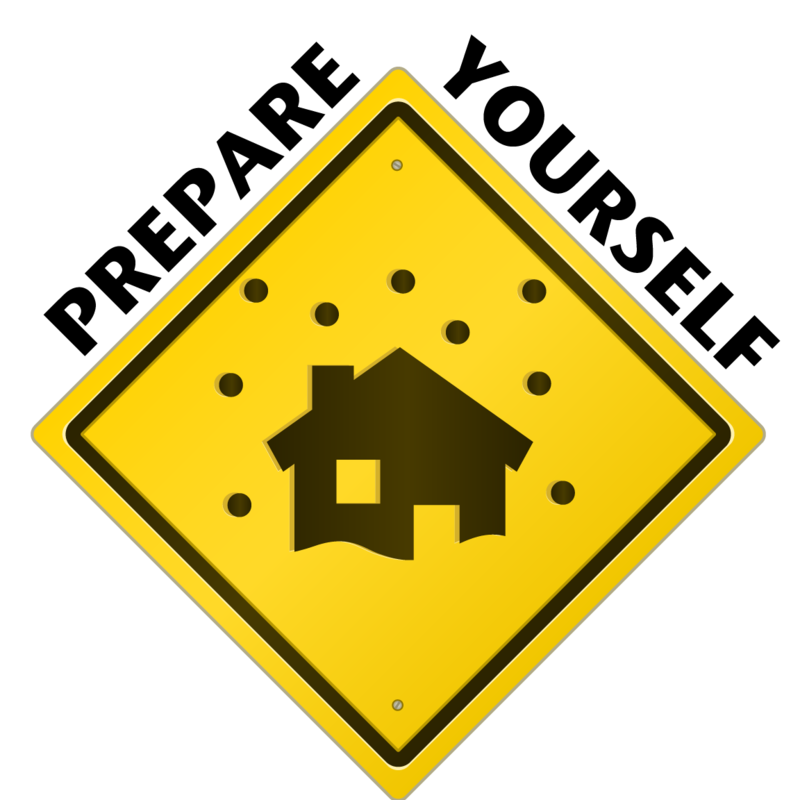 Dirt and dust balls can create a fire hazard. Over time, and with repetition, electrical safety in the kitchen can become second nature.